Latest ma.log file pasted below. Sorry I keep pasting the entire file within the post, if there's a better way to share it please let me know. WARN  2018-10-09T13:56:10,249 (com.serotonin.m2m2.rt.dataSource.PollingDataSource.incrementUnsuccessfulPolls:157) - Data Source UT, Salt Lake Simple Agent KW Meter aborted 61 polls since it started. WARN  2018-10-09T13:57:24,948 (com.serotonin.m2m2.rt.dataSource.PollingDataSource.incrementUnsuccessfulPolls:157) - Data Source TN, Nashville Simple Agent KW Meter aborted 62 polls since it started. WARN  2018-10-09T14:23:27,522 (com.serotonin.m2m2.rt.dataSource.PollingDataSource.incrementUnsuccessfulPolls:157) - Data Source Mango Internal aborted 1 polls since it started. WARN  2018-10-09T14:33:29,100 (com.serotonin.m2m2.rt.dataSource.PollingDataSource.incrementUnsuccessfulPolls:157) - Data Source NC, Charlotte Simple Agent KW Meter aborted 6172 polls since it started. WARN  2018-10-09T14:37:19,099 (com.serotonin.m2m2.rt.dataSource.PollingDataSource.incrementUnsuccessfulPolls:157) - Data Source AL, Montgomery Simple Agent KW Meter aborted 4330 polls since it started. Thanks for the help Phil - it is processing right now .. Keeping the fingers crossed. If this works correctly then I'll go back and do a JSON config import of the rest of the data sources and points I care about and repeat the process. This will be really helpful when integrating sites/controllers for clients on a dev/test Mango server first and then migrating the data and polling to the client's production environment. I'll report back after it is done processing ..
That shouldn't prevent the rest of the data migration to complete though - correct? Oh, look at that, someone must have changed the tab names and I hadn't noticed. 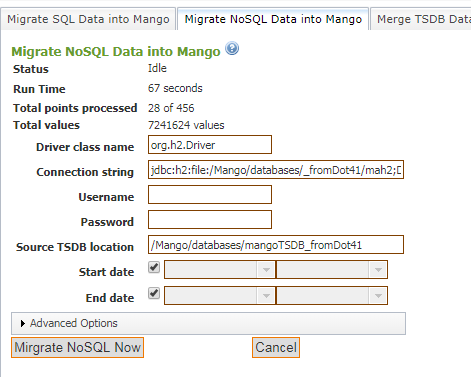 Yes, you want the "Migrate NoSQL Data Into Mango" tab. That should have inputs for an SQL database and a NoSQL database. I guess someone else didn't like 'Mergration' either. Originally there was Migration (from SQL) and Merge (from a same-point-ids NoSQL) and so I called the 'both' type a Mergration. I guess that didn't stick! Ha gotcha - Thanks for the clarification. I just gave it a try and looks like having the Mango Internal data source in both servers is a problem when trying to migrate NoSQL data into Mango. Merge or Mergration ? You need to do a Mergration if you restored the configuration from the JSON import. Not Merge. I used the "Merge TSDB Data into Mango" tab. You are saying I should have used the "Migrate NoSQL Data Into Mango" - correct? Just want to be clear as I'm unsure of what the "Mergreation" tool is ..
What I meant was: the intention of the new Mango server is not to be a replica of our existing Mango server - I don't want to move all the datasources and datapoints - I only want a select subset. Hence why I don't want to restore the entire database of the old Mango server into the new Mango server, I only want the datasources and points I care for and their history. Hi Phil - thanks for the response. I ran into an issue. I exported a small subset of the data sources and their points and imported their JSON configuration into the new Mango server. I copied the entire Mango/databases/MangoTSDB directory from the old Mango server into a Mango/databases/MangoTSDB_fromDot41 in my new Mango server. Then I went ahead and used the "Merge TSDB Data Into Mango" tool in the /mango_no_sql.shtm page. I pointed the Source TSDB location to the MangoTSBB_fromDot41 directory I mentioned above and left all the other settings at default value. Latest ma.log file is pasted below. WARN  2018-10-09T00:32:59,100 (com.serotonin.m2m2.rt.dataSource.PollingDataSource.incrementUnsuccessfulPolls:157) - Data Source NC, Charlotte Simple Agent KW Meter aborted 2380 polls since it started. WARN  2018-10-09T00:36:04,099 (com.serotonin.m2m2.rt.dataSource.PollingDataSource.incrementUnsuccessfulPolls:157) - Data Source AL, Montgomery Simple Agent KW Meter aborted 1633 polls since it started. WARN  2018-10-09T01:32:59,100 (com.serotonin.m2m2.rt.dataSource.PollingDataSource.incrementUnsuccessfulPolls:157) - Data Source NC, Charlotte Simple Agent KW Meter aborted 2650 polls since it started. WARN  2018-10-09T01:36:04,100 (com.serotonin.m2m2.rt.dataSource.PollingDataSource.incrementUnsuccessfulPolls:157) - Data Source AL, Montgomery Simple Agent KW Meter aborted 1825 polls since it started. WARN  2018-10-09T02:33:09,100 (com.serotonin.m2m2.rt.dataSource.PollingDataSource.incrementUnsuccessfulPolls:157) - Data Source NC, Charlotte Simple Agent KW Meter aborted 2921 polls since it started. WARN  2018-10-09T02:36:04,099 (com.serotonin.m2m2.rt.dataSource.PollingDataSource.incrementUnsuccessfulPolls:157) - Data Source AL, Montgomery Simple Agent KW Meter aborted 2017 polls since it started. WARN  2018-10-09T03:33:09,100 (com.serotonin.m2m2.rt.dataSource.PollingDataSource.incrementUnsuccessfulPolls:157) - Data Source NC, Charlotte Simple Agent KW Meter aborted 3192 polls since it started. WARN  2018-10-09T03:36:19,099 (com.serotonin.m2m2.rt.dataSource.PollingDataSource.incrementUnsuccessfulPolls:157) - Data Source AL, Montgomery Simple Agent KW Meter aborted 2210 polls since it started. WARN  2018-10-09T04:33:09,099 (com.serotonin.m2m2.rt.dataSource.PollingDataSource.incrementUnsuccessfulPolls:157) - Data Source NC, Charlotte Simple Agent KW Meter aborted 3462 polls since it started. WARN  2018-10-09T04:36:34,099 (com.serotonin.m2m2.rt.dataSource.PollingDataSource.incrementUnsuccessfulPolls:157) - Data Source AL, Montgomery Simple Agent KW Meter aborted 2403 polls since it started. INFO  2018-10-09T05:00:00,008 (com.infiniteautomation.nosql.maint.MangoNoSqlBackupWorkItem.execute:130) - Starting Mango NoSQL Backup WorkItem. WARN  2018-10-09T05:33:09,099 (com.serotonin.m2m2.rt.dataSource.PollingDataSource.incrementUnsuccessfulPolls:157) - Data Source NC, Charlotte Simple Agent KW Meter aborted 3732 polls since it started. WARN  2018-10-09T05:36:34,099 (com.serotonin.m2m2.rt.dataSource.PollingDataSource.incrementUnsuccessfulPolls:157) - Data Source AL, Montgomery Simple Agent KW Meter aborted 2595 polls since it started. WARN  2018-10-09T06:33:09,099 (com.serotonin.m2m2.rt.dataSource.PollingDataSource.incrementUnsuccessfulPolls:157) - Data Source NC, Charlotte Simple Agent KW Meter aborted 4002 polls since it started. WARN  2018-10-09T06:36:34,099 (com.serotonin.m2m2.rt.dataSource.PollingDataSource.incrementUnsuccessfulPolls:157) - Data Source AL, Montgomery Simple Agent KW Meter aborted 2787 polls since it started. WARN  2018-10-09T07:33:09,100 (com.serotonin.m2m2.rt.dataSource.PollingDataSource.incrementUnsuccessfulPolls:157) - Data Source NC, Charlotte Simple Agent KW Meter aborted 4272 polls since it started. WARN  2018-10-09T07:36:49,099 (com.serotonin.m2m2.rt.dataSource.PollingDataSource.incrementUnsuccessfulPolls:157) - Data Source AL, Montgomery Simple Agent KW Meter aborted 2980 polls since it started. WARN  2018-10-09T07:57:59,331 (com.serotonin.m2m2.rt.dataSource.PollingDataSource.incrementUnsuccessfulPolls:157) - Data Source Mango Internal aborted 4 polls since it started. WARN  2018-10-09T08:33:09,100 (com.serotonin.m2m2.rt.dataSource.PollingDataSource.incrementUnsuccessfulPolls:157) - Data Source NC, Charlotte Simple Agent KW Meter aborted 4544 polls since it started. WARN  2018-10-09T08:36:49,099 (com.serotonin.m2m2.rt.dataSource.PollingDataSource.incrementUnsuccessfulPolls:157) - Data Source AL, Montgomery Simple Agent KW Meter aborted 3173 polls since it started. WARN  2018-10-09T08:59:59,107 (com.serotonin.m2m2.rt.dataSource.PollingDataSource.incrementUnsuccessfulPolls:157) - Data Source Mango Internal aborted 8 polls since it started. WARN  2018-10-09T09:33:09,100 (com.serotonin.m2m2.rt.dataSource.PollingDataSource.incrementUnsuccessfulPolls:157) - Data Source NC, Charlotte Simple Agent KW Meter aborted 4814 polls since it started. WARN  2018-10-09T09:36:49,099 (com.serotonin.m2m2.rt.dataSource.PollingDataSource.incrementUnsuccessfulPolls:157) - Data Source AL, Montgomery Simple Agent KW Meter aborted 3365 polls since it started. WARN  2018-10-09T10:33:19,099 (com.serotonin.m2m2.rt.dataSource.PollingDataSource.incrementUnsuccessfulPolls:157) - Data Source NC, Charlotte Simple Agent KW Meter aborted 5085 polls since it started. WARN  2018-10-09T10:36:49,099 (com.serotonin.m2m2.rt.dataSource.PollingDataSource.incrementUnsuccessfulPolls:157) - Data Source AL, Montgomery Simple Agent KW Meter aborted 3557 polls since it started. WARN  2018-10-09T11:03:53,668 (com.serotonin.m2m2.rt.dataSource.PollingDataSource.incrementUnsuccessfulPolls:157) - Data Source Mango Internal aborted 9 polls since it started. WARN  2018-10-09T11:33:19,099 (com.serotonin.m2m2.rt.dataSource.PollingDataSource.incrementUnsuccessfulPolls:157) - Data Source NC, Charlotte Simple Agent KW Meter aborted 5356 polls since it started. WARN  2018-10-09T11:37:04,099 (com.serotonin.m2m2.rt.dataSource.PollingDataSource.incrementUnsuccessfulPolls:157) - Data Source AL, Montgomery Simple Agent KW Meter aborted 3750 polls since it started. WARN  2018-10-09T12:33:19,099 (com.serotonin.m2m2.rt.dataSource.PollingDataSource.incrementUnsuccessfulPolls:157) - Data Source NC, Charlotte Simple Agent KW Meter aborted 5626 polls since it started. WARN  2018-10-09T12:37:19,099 (com.serotonin.m2m2.rt.dataSource.PollingDataSource.incrementUnsuccessfulPolls:157) - Data Source AL, Montgomery Simple Agent KW Meter aborted 3943 polls since it started. INFO  2018-10-09T12:40:35,231 (com.infiniteautomation.tsdb.impl.IasTsdbImpl.<init>:239) - Corruption scan for database at /Mango/databases/mangoTSDB_fromDot41 skipped because the database is configured not to run scan. WARN  2018-10-09T12:54:09,637 (com.serotonin.m2m2.rt.dataSource.PollingDataSource.incrementUnsuccessfulPolls:157) - Data Source VT, Burlington Simple Agent KW Meter aborted 1 polls since it started. WARN  2018-10-09T12:56:10,249 (com.serotonin.m2m2.rt.dataSource.PollingDataSource.incrementUnsuccessfulPolls:157) - Data Source UT, Salt Lake Simple Agent KW Meter aborted 1 polls since it started. WARN  2018-10-09T12:56:54,948 (com.serotonin.m2m2.rt.dataSource.PollingDataSource.incrementUnsuccessfulPolls:157) - Data Source TN, Nashville Simple Agent KW Meter aborted 1 polls since it started. WARN  2018-10-09T13:02:09,623 (com.serotonin.m2m2.rt.dataSource.PollingDataSource.incrementUnsuccessfulPolls:157) - Data Source Mango Internal aborted 11 polls since it started. I have a new installation of Mango (3.5) and I'd like to move a number of data sources, their points and all of their saved historic data off of another existing Mango server (3.4) into the new one. I've spent some time reading other posts in this forum dealing with a similar question, but I can't find a clear answer. I know I can easily export and import the data sources I want and their points using the Configuration Import/Export feature in the emport.shtm page, and this works great. However I'm looking to move all their respective saved history data as well. I also know I can do a data point history export under the data_point_details.shtm and importing them in the dataImport.shtm page - but this can be tedious when dealing with a total of thousands of data points. Is there another easy way to achieve this WITHOUT having to duplicate/replicate the entire old Mango server (3.4) AND without having to manually do a CSV/Excel export and import for each one of the data points we care about? Hi Phil - thanks for the prompt response. I have a new finding. I now get a response when accessing the http page via command line from the server ( using the wget -p http://localhost:8080 command), but can't access it from any of our other servers running in the same LAN. So now I no longer think this is an issue with the Mango instance, but rather a network/firewall issue most likely. I will look further into it and report back with my findings after the weekend. Thanks again for the prompt response! I have a new install of the 3.5.0-beta.3 running on a brand new install of CentOS 7. Oracle's JDK 1.8 is installed and running. JAVA_HOME directory is correctly set. I can run the ./ma.sh start and Mango will start with no errors and no issues. However, I can't access the html page running on port 8080. I did not change the default port. The browser's built-in Network analyzer tool simply says unable to establish a connection. Any ideas what could be causing this? The OS shows the process running with no issues. Below is a copy-paste of the latest ma.log file.